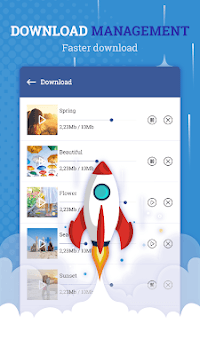 Video downloader for facebook is the highest quality video download application from facebook with the push of a button and automatically saves videos to your library. 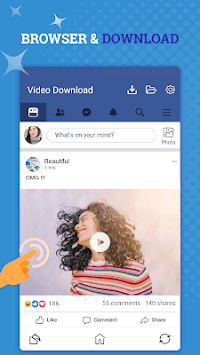 With Video Downloader for Facebook you can login to Facebook via your Facebook account with the interface experience like on the Facebook Web application. You can browse news of friends, celebrities, fanpage... right on your Facebook page. 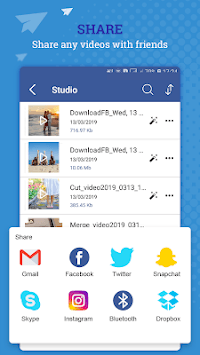 Automatically get the video link you are watching video to download and you can download it right away to save it to your Android device. The application supports you to edit videos or share it with friends. 2. Play the video you want to download. 3. Click BUTTON "Download video". 1: Easy to use Facebook Web interface. 2: Allows you to save videos to your device. 3: Play, edit the video and share it to your friends. Download Video downloader for Facebook now to download videos from Facebook that you like best. - This application does not collect or transmit any of your data. - This application is not endorsed, supported or certified by Facebook and it is provided by a non-Facebook related third party, it login to Facebook social network through a very secure and secure Web interface. - Any action to download content that infringes intellectual property rights is the responsibility of the user. We do not recommend downloading copyrighted videos.